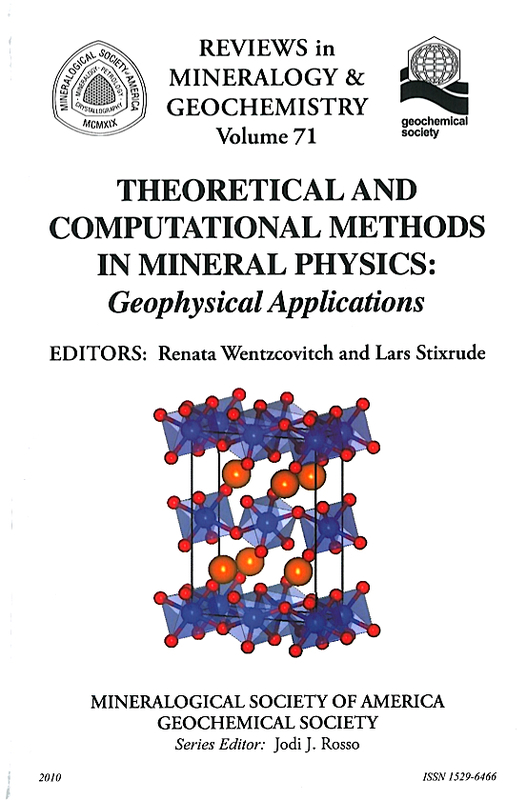 The chapters in this volume represent an extensive review of the material presented by the invited speakers at a short course on Theoretical and Computational Methods in Mineral Physics held prior (December 10-12, 2009) to the Annual fall meeting of the American Geophysical Union in San Francisco, California. The meeting was held at the Doubletree Hotel & Executive Meeting Center in Berkeley, California. Mineral physics is one of the three pillars of geophysics, the other two being geodynamics and seismology. Geophysics advances by close cooperation between these fields. As such, mineral physicists investigate properties of minerals that are needed to interpret seismic data or that are essential for geodynamic simulations. To be useful, mineral properties must be investigated in a wide range of pressures, temperatures, and chemical compositions. The materials and conditions in the interior of Earth and other terrestrial planets present several challenges. The chemical composition of their mantles is complex with at least five major oxide components and tens of solid phases. Today, these challenges are being addressed by a combination of experimental and computational methods, with experiments offering precise information at lower pressures and temperatures, and computations offering more complete and detailed information at conditions more challenging to experiments. While bulk properties of materials are fundamental to understanding a planet’s state, atomistic inspection of these complex materials are fundamental to understanding their properties. A connection is then established between atomic and planetary scale phenomena, which mineral physicists are in a unique position to appreciate. 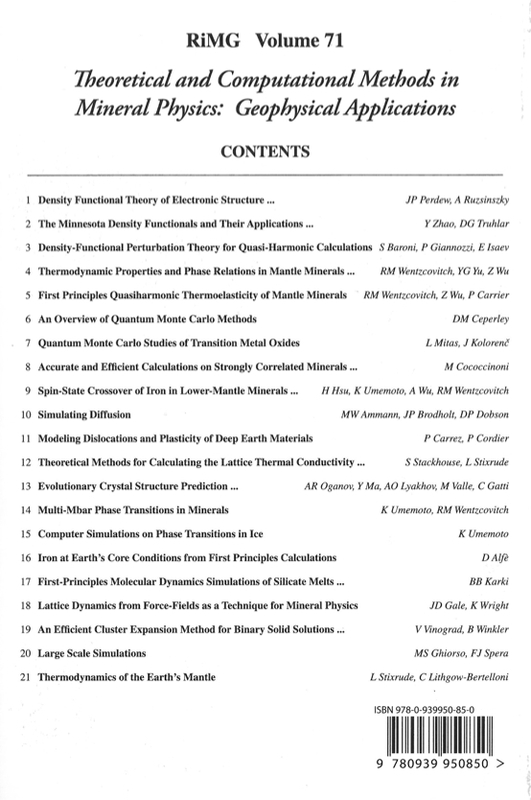 This book presents a set of review articles offering an overview of contemporary research in computational mineral physics. Fundamental methods are discussed and important applications are illustrated. The opening chapter by John Perdew and Adrienn Ruzhinszky discusses the motivation, history, and expressions of Kohn-Sham Density Functional Theory (DFT) and approximations for exchange and correlation. This is the established framework for investigation of a condensed matter system’s ground state electronic density and energy. It also discusses the recent trend to design higher-level semi-local functionals, with solid state applications in mind. It presents arguments in favor of semi-local approximations for condensed matter and discusses problematic cases where fully non-local approximations are needed. The following article by Yan Zhao and Donald Truhlar, demonstrates current research in search of appropriate exchange and correlation energy functionals. It reviews the performance of families of local, semi-local, and fully non-local exchange and correlation functionals: the so-called “Minnesota” functionals. These new functionals have been designed to give broad accuracy in chemistry and perform very well in difficult cases where popular functionals fail badly. The prospects for their successful applications are encouraging. Stefano Baroni, Paolo Gianozzi, and Eyvaz Isaev, introduce Density Functional Perturbation Theory, a suitable technique to calculate vibrational properties of extended materials using a combination of density functional theory and linear response techniques. This method gives very accurate phonon frequencies which, in combination with the quasi-harmonic approximation, allow one to study thermal properties of materials. The next chapter by Renata Wentzcovitch, Yonggang Yu, and Zhongqing Wu review the applications of density functional perturbation theory to the investigation thermodynamic properties and phase relations in mantle minerals. The series of studies summarized in this review have explored the accuracy of DFT within its most popular approximations for exchange and correlation energy in combination with the quasiharmonic approximation to offer results with useful accuracy for geophysical studies. The following article by Renata Wentzcovitch, Zhongqing Wu, and Pierre Carrier, summarizes the combination of the quasiharmonic approximation with elasticity theory to investigate thermoelastic properties of minerals at conditions of the Earth interior. Some unfamiliar but essential aspects of the quasiharmonic approximation are discussed. Thermoelastic properties of minerals are essential to interpret seismic observations. Therefore, some examples of interpretation of seismic structures are reviewed. The article by David Ceperley, returns to the fundamental theme of calculations of ground state energy in condensed matter and introduces Quantum Monte Carlo methods. These methods treat exactly the quantum many-body problem presented by a system of electrons and ions. They treat electrons as particles rather than a scalar charge-density field, as done by DFT. These are computationally intensive methods but the only exact ones. The following article by Lubos Mitas and Jindrich Kolorenc, reviews applications of these methods to transition metals oxides, materials that have some aspects in common with mantle minerals. One of the examined systems, FeO, is a most important component of mineral solid solutions. Matteo Cococcioni continues exploring the same theme. He discusses a modified density functional useful for addressing cases like FeO, which are untreatable by standard DFT. The DFT + Hubbard U method (DFT+U) is a practical approximate method that enables investigations of electronically and structurally complex systems, like minerals. The application of this method to a contemporary and central problem in mineral physics, pressure and temperature induced spin-crossovers in mantle minerals, is reviewed in the next chapter by Han Shu, Koichiro Umemoto, and Renata Wentzcovitch. The geophysical implications of the spin-crossover phenomenon, an electronic transition, are still unclear but some possibilities are suggested. Michael Ammann, John Brodholt, and David Dobson discuss simulations of bulk ionic diffusion. This property plays an important role in chemical exchange between and within crystalline and melt phases. It plays an important role in the kinetics of phase transitions, compositional zoning, mineral growth, and other important geochemical processes. It can also control rheological properties, especially in the diffusion creep regime, and thus the time scale of mantle convection. This is a very difficult property to investigate at combined pressures and temperature conditions of the mantle, therefore, calculations play a very important role in this area. Phillip Carrez and Patrick Cordier discuss modeling of dislocations and plasticity in deep Earth materials. This article focuses on recent developments in dislocation modeling and applications to our understanding of how the direction of mantle flow is recorded in polycrystalline texture. Next, the article by Stephen Stackhouse and Lars Stixrude, discusses theoretical methods for calculating lattice thermal conductivity in minerals, which controls the cooling of Earth’s core. Measurements of thermal conductivity at lower mantle conditions are very challenging to experiments and calculations are a valuable alternative to learning about this property. This article describes the most common methods to calculate this property and presents a review of studies of the lattice thermal conductivity of periclase. Artem Oganov discusses the prediction of high pressure crystal structures. A genetic algorithm for structural prediction is described and numerous applications predicting new phases with novel properties and phases that can explain experimental data so far not understood is presented. This is a most recent development on the subject of structural predictions, a subject that has been pursued by simulations for several decades now. The possibility of predicting structure and composition by this method is also pointed out. Koichiro Umemoto and Renata Wentzcovitch continue on the same theme of structural prediction by a different approach: combination of phonon calculations and variable cell shape molecular dynamics. The former indicates unstable displacement modes in compressed structures; the latter searches for structures resulting from the superposition of these unstable modes to the compressed lattice. This approach is illustrated with the search of mineral structures at multi-Mbar pressures that are still challenging to static or dynamic compression experiments, but have great interest in view of the discovery of terrestrial exoplanets with several Earth masses. The following chapter by Koichiro Umemoto is on simulations of phase transitions on a different class of planet forming material: H2O-ice. Ice has a rich phase diagram but many of its phase relations are unknown: large hysteresis precludes their direct measurements in manageable time scales. Therefore, calculations acquire special significance but they are also challenging, the main reasons being the description of hydrogen bond by DFT and hydrogen disorder. Dario Alfè presents a review of first principles calculations of properties of iron at Earth’s core conditions. This chapter includes examples of applications of multiple techniques used in studies of high temperature properties, structure, and melting lines. Results from Quantum Monte Carlo are compared with those from DFT, and results from molecular dynamics simulations are contrasted with predictions of quasiharmonic theory. These comparisons are instructive and illustrate the breadth of research in computational mineral physics. The following chapter by Bijaya Karki turns to DFT based simulations of another type of melt: ionic silicates and oxides. The article discusses the methodology used in these simulations and specially developed methods to analyze the results. The properties of interest are high temperature equations of state, thermodynamics properties, atomic and electronic structure, and self-diffusion and viscosity. Visualization of atomic motion is one of the valuable approaches discussed to gain insight into changes in melt structure with pressure and temperature. These studies are illustrated for 3 melts along the MgO-SiO2 join. The following three articles are devoted primarily to the introduction of inter-atomic potentials of broad applicability and relatively high accuracy, and applications to large scale simulations. The first article by Julian Gale and Kate Wright describes the current status of the derivation of force-fields and their applications to static and lattice dynamic calculations in mineral physics. This is done in the context of the General Utility Lattice Program (GULP), which has become quite popular. A selection of applications illustrating the possibilities of this code is then presented. Victor Vinograd and Bjoern Winkler illustrate another important type of application of force-field models: an efficient cluster expansion method to investigate binary mineral solid solutions. The article focuses on a rock-salt system but the technique is general. This type of problem is central to mineral physics and ingenious combinations of first principles methods, force-field models, and purely parameterized free energy expressions, combined with molecular dynamics and Monte Carlo techniques are necessary to address this problem. The predictive treatment of properties of ionic solid solutions is a major challenge in mineral physics. Mark Ghiorso and Frank Spera discuss long duration large scale molecular dynamics simulations using empirical pair-potentials. This article illustrates the concrete requirements on the number of atoms and time scales necessary to obtain information on transport properties such as shear viscosity and lattice thermal conductivity using Green-Kubo theory. These more than 1000-atom and pico-second simulations also improve the statistics in the estimation of equilibrium properties. Finally, the article by Lars Stixrude and Carolina Lithgow-Bertelloni on the thermodynamics of Earth’s mantle, gives an overview of how the elucidation of materials behavior governs planetary processes. It explains how the complexity of the Earth’s mantle demands methods that are complementary to first principles calculations and experiments. These methods must allow one to interpolate among and extrapolate from results on minerals with limited compositions to the full chemical richness of the silicate mantle. It then illustrates how the derived properties of multi-phase multi-component systems are used to address mantle heterogeneity on multiple length scales, ranging from that of the subducting slab to the possibility of mantle-wide radial variations in bulk composition.